Want to see South America in a way very few visitors can? Want to visit the big cities, see wildlife, and go through the majestic fjords of Chile without unpacking? Book a berth on a luxury South America cruise and you can make it happen. South American cruises are packed with exciting culture in historic port cities, diverse urban environments, and delicious cuisine on land and at sea. From Lima to Buenos Aires, travelers to South America will find themselves embarking on numerous adventures throughout this wonderful continent and seeing fantastic sites. With that in mind, if you’re thinking of setting sail on a South American cruise this year, we’ve put together some highlights of what you could experience along the way. Founded by the Spanish conquistadors in the 1500s, Lima has a historic center core, then leafy, pleasant neighborhoods like Miraflores, San Isidro, and Barranco to explore. Lima has become the foodie hotspot of South America and has several restaurants that rate among the best in the world. Take some time to explore the city before boarding the ship in Callao Port. Visit the ossuary in the Basilica of San Francisco, with the bones of some 70,000 people, see the hang gliders soaring over the cliffs from Larcomar, or try your luck at a local casino while drinking a pisco sour. 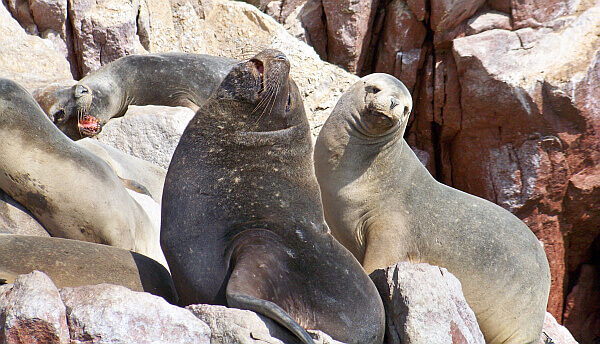 You take a zodiac excursion from the ship after reaching Paracas to explore the Ballestas Islands just off the coast of Peru. There are so many sea birds resting and nesting on these rocky orange islands that the surface turns white and farmers come here to harvest guano for their crops. Down by the water, huge male sea lions and their concubines eat, lounge, and swim, occasionally barking at each other when some invisible territorial line is crossed. If you’re lucky you’ll also catch some Humboldt penguins. After a few days at sea heading south where the desert meets the sea, the land becomes more lush and you may see the Andes in the distance. Then you arrive at the city of Valparaiso, an important port city for centuries. The houses, stairs, and funicular trains all seem to be precariously perched on the steep mountainsides, with a panoramic view of the bay. It’s a city of art and culture, plus around every corner there’s some kind of street mural. It’s easy touring distance from here to visit some of Chile’s best wineries, so don’t pass up the chance to take a sipping wine tour excursion inland for the day. Heading south in Chile, the first stop is Puerto Montt, the hardest part will be deciding what to do on shore. The next stop is Chiloé Island, a great place to work off some of those good meals by hiking through the countryside and visiting the UNESCO World Heritage historic churches of the region. You’ll then spend days admiring the countryside of southern Chile, in the wildest parts of Patagonia. The Chilean Fjords are both dramatic and tranquil, captivating and calming. Here where the Southern Cone narrows, this land of water, islands, and nature-sculptured ice is a unique attraction best seen from the water. From the ship’s deck you can cruise through the Chilean fjords with views of forests, volcanoes, and glaciers that are hard to duplicate anywhere else on the planet. Bring the binoculars for wildlife spotting. In the Magellan Strait, cruises stop at Magdalena Island, a breeding location for many species of birds including the Magellanic Penguin. 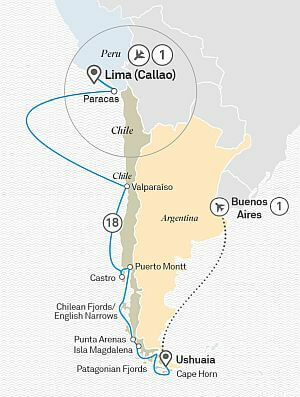 On Day 19 of the luxury South America cruise, you round Cape Horn, where the Atlantic and Pacific Ocean meet. It’s the most southern tip of Chile, lying at the very end point of the Tierra del Fuego archipelago. Once your captain powers through the temperamental seas here, you’ll hit calm waters in Ushuaia then disembark for dry land again. It’s a long haul up to the capital of Argentina, so the last leg of the trip is by plane. You’ll go from the world’s most southernmost city to one of South America’s most vibrant. Buenos Aires provides enough cosmopolitan, exciting culture for even the most experienced traveler. Soak up the city’s unique atmosphere by wandering the neighborhoods and ducking into cafes. Eat some grilled meat with a hearty malbec, catch a tango show, and maybe enjoy a concert or museum. For more information on this particular passage or other luxury cruises in South America, check out Scenic Luxury Cruises and Tours. Catch the Next Total Solar Eclipse in South America 6 Epic South America Road Trips You Can Do in a Rental Car 5 Top Hikes in Patagonia, South America South America Wine Tours: Chile, Argentina, or Both?